Almost every slot on that sign is for gasoline that is just about or over $4 per gallon. And it looks like the prices are getting ready to go up again, judging by the blank number squares on the medium-grade and premium-grade price slots. These gasoline prices are approaching a three-year high. Remember 2008 at this time, when gasoline prices were well over $4 a gallon here in Southern California? We’re almost back to those days. 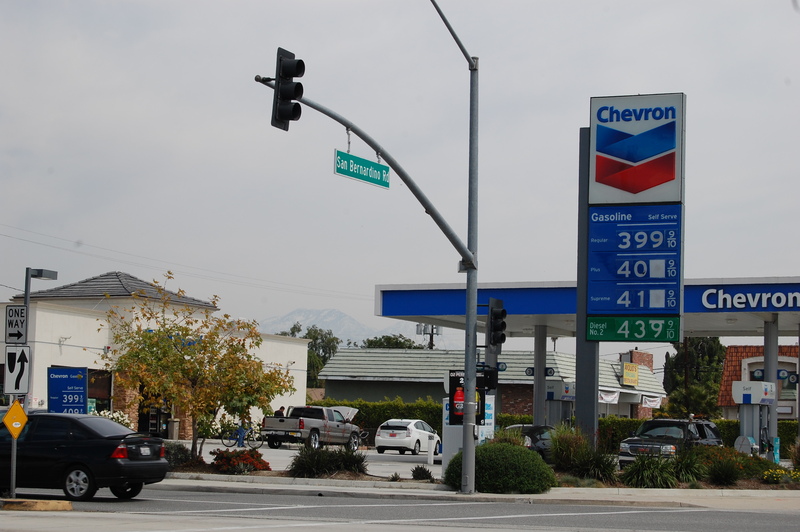 *I filled up here at this Chevron Station in Covina, California, today, and it cost me well over $50 for my 13-gallon tank on my gas-stingy VW Jetta. I don’t remember a fill-up going over $50 in a long, long time. Also, according to Independent Sen. Bernie Sanders of Vermont, Chevron received a $19 million refund from the IRS last year. That was after the energy giant made $10 billion in profits the year before. After listening to the president’s speech tonight, I am of the understanding that he is trying to explain the reasons for the bombing of Libya. And in doing so, well, it’s complicated. This president likes to be professorial. He explained that no, the military action is not part of regime change. “We’ve been down that road in Iraq,” he said, dismissively. Instead, the no-fly zone protected a massacre from occuring in Libya and enabled those “young people” to pursue a new government. The rest of the actions — freezing Libya’s $33 billion in assets, international pressures, embargoes, etc., hopefully will convince Gadhafi to leave. Will this work? I am not sure. Obama’s long-winded explanation is his way of filling us in on his philosophy. And it is also a way to look like, sound like and act like the military leader of the United States. Americans and pundits looking for a black-and-white explanation aren’t going to get it from this guy. He’s way too nuanced in his speeches. One last nuance I noticed. It is the way he tried to rally young people to his side. He was saying sometimes the U.S. military forces can be used to help the young people of the world improve their lives. It happened in Egypt and Tunisia. Why not now Libya? I wonder how the young people in this country react to that? Do young people really care? Do they support the U.S. military in this case? If so, this could be a case where military might is supported — not protested — by young Americans. I’m waiting to see what the reaction is here in America. Or will young people just go about their normal business and not care at all. 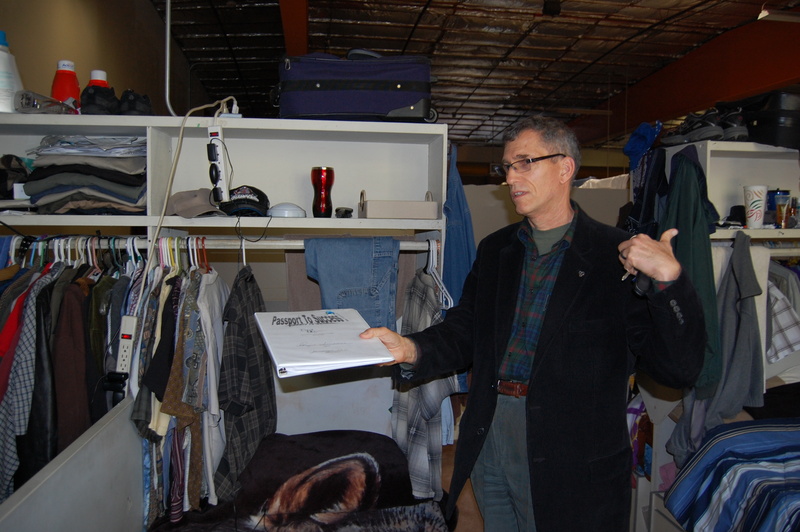 Ted Knoll shows us the living quarters for those homeless at Whittier First Day. Ted Knoll of the Whittier First Day Coalition keeps a scrapbook filled with newspaper clippings detailing the community angst over the homeless shelter’s opening a decade ago. It’s a little odd to hold onto all the reminders of the past, especially negative ones. But it’s in keeping with Knoll’s philosophy that a homeless shelter should not be out-of-sight, out-of-mind. Instead of hiding his residents, he boasts about them. He even sends them out to give back to the community. On a wall above the bookcase where the scrapbooks are kept is a plaque celebrating the Community Angels, a volunteer program. These are not members of the community who volunteer at the shelter; these are shelter residents who volunteer in the community. On a recent sunny afternoon, Knoll gave me and Public Editor Larry Wilson a tour of the facility off Whittier Boulevard, which includes not only temporary housing, but social services, a kitchen/dining area for meals, and a health clinic that has recently been given the green light by the city of Whittier to expand. I wrote a while back about how a small businessman lost his bagel shop, became homeless and began receiving hope from a group of churches’ homeless coalition in Rancho Cucamonga. I’ve also interviewed homeless expert Andy Bales with the Union Rescue Mission on Los Angeles’ Skid Row. But this story is more about a unique suburban model for rescuing people experiencing homelessness. The successful approach, called the Reciprocal Community Engagement Model (RCEM), is one other cities are checking out. Last week, staff members from West Covina City Manager Andy Pasmante’s office took the tour and briefed the city manager on what they’d seen. Pasmante told me he was still gathering data on the various homeless services in the region. Not too long ago, West Covina balked at establishing a permanent shelter in the town after it was volunteered by a regional agency. Knoll’s Whittier First Day could be the bridge that helps the East San Gabriel Valley establish its first permanent homeless shelter. Whittier First Day’s success is documented by a study released a year ago by the Center for Nonprofit Management. Knoll’s overarching theory is to first gain community support because “homelessness results and persists from a deficit of relationships as much as it does from a deficit of social services,” the report found. So it formed partnerships with the city, the county, other nonprofits and even with Presbyterian Intercommunity Hospital. The facility’s Health and Wellness Clinic averages 500 visits a year in only two days of use per week. As a result, emergency room visits at nearby PIH dropped by 70 percent, saving the hospital about $1 million, the report found. Likewise, on-sight social workers and job counselors helped 45 percent of its residents find employment in 2009. It also provides residents a savings plan and helped establish a nonprofit group made up of residents who elect officers to represent them at First Day staff meetings. Last year, the residents even built and rode in a float in the Whittier Christmas Parade. If a city wants to establish a homeless shelter, it should ask how the shelter will benefit the entire community. If the answer is “not much,” maybe it should not get built. I haven’t missed a vote in 34 years. 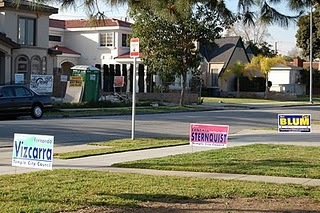 Many of our local cities have city council elections today. Call your city hall and check if you are not sure. In April, Monrovia and Arcadia Unified school board will hold elections. 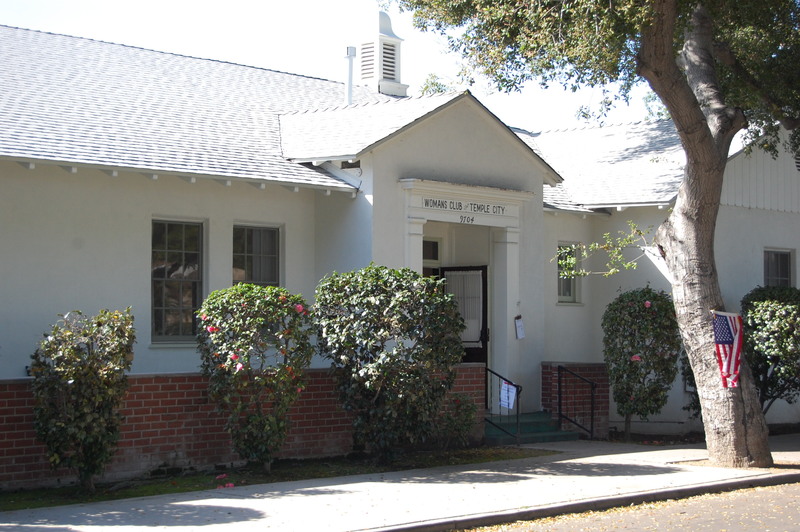 Below is the polling place where I voted, the Women’s Club in Temple City. 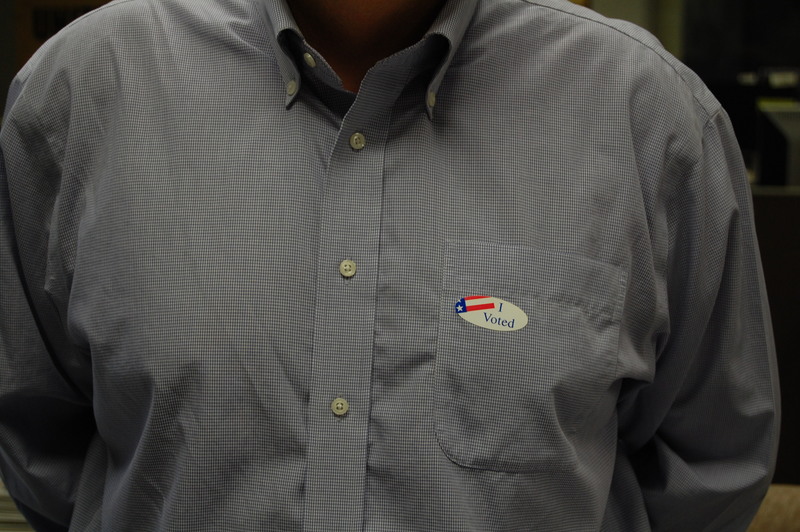 This morning there was a steady stream of voters. That’s good! Polls can close at 7 p.m. in some cities, 8 p.m. in others. You still have time to vote. “Exercise your right to vote,” implored the disc jockey on The Sound, 100.3-FM. This DJ combined two of my favorite things – voting and rock music. So I went ahead and voted for “Another One Bites the Dust,” the third “candidate” in a musical bloc by Queen. The same day, the newspaper headlines spoke of Fox’s “American Idol” charting at No. 1. The lure of picking the next rock star continues to attract millions of online and phone-line voters. The act of voting has mass appeal. It’s the starting point for my little survey of voting rates in local city elections. Ah, I just lost about half of you, correct? If it ain’t about Charlie Sheen, Amy Winehouse or “American Idol,” few people care. Many cities have elections on March 8. If you don’t know, call your city clerk and ask. If the answer is “yes,” ask them where your polling place is. Then walk, drive or bicycle to the site – which will be open from 7 a.m. to 8 p.m. – and vote. (For cities that hold elections on April 12 – Monrovia, Arcadia school board – or on Nov. 8, consider this a primer.) It’s easy, it’s fun, it’s your duty. (If you want suggestions on who to vote for, go to our website and click on the American Flag/Results and Complete Coverage and see Elections – Our View.) But each year, that message registers with fewer than 20 percent of the voting population. San Dimas: March 2009: 13.6 percent; March 2007: 18.5 percent. Temple City: March 2009: 21 percent; March 2007: 20 percent. About 1 in 5 of those registered to vote voted for City Council in a city in which one member has gone to jail and another now ex-member faces jail time for conduct while on the council. La Verne and Covina canceled their elections this year for lack of candidates. What does this say? Should we as Americans, as residents of Los Angeles County, be happy with only 1 in 5 adults determining the makeup of our local government? I could not have said it any better myself, Sue. Just flip on the news and you’ll see people in Tunisia, Egypt and Libya literally dying for freedom, which includes the right to vote for their own leaders. Presidential elections here in the U.S. have picked up on this freedom thing. In the 2008 election, voter turnout was 61.7 percent of those eligible, 131 million ballots cast, the largest turnout since 1968. Still, I am ashamed to report that 60 percent number when people are dying on the streets of Tripoli. Pico Rivera: November 2009: 15.6 percent voted on a utility users tax measure. Statewide that year, voters went to the polls to decide 114 local measures and of those, 57 were relating to taxes, fees, school bonds, etc. In other words, one out of five adults are determining what we pay in local taxes. That’s a warped version of democracy.